Texas-based modern rock band Blue October knows a little too much about the capricious workings of the music industry. After building a local buzz and releasing a self-produced LP in the late '90s, they were signed to Universal Records. Then dropped. Then signed again. With so many fresh starts, it's no wonder their music still sounds new. 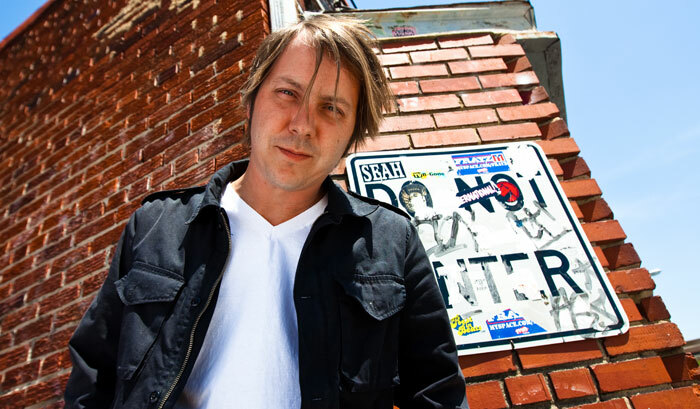 On the band's recently released fifth album, Approaching Normal, Blue October teamed with producer Steve Lillywhite to create music that merges raw emotion with industrial-strength hooks--not to mention a dose of righteous anger toward the hand that feeds them on songs like "Dirt Room," the album's first single. Drums are like therapy, for both the players and the listeners. It's a healthy way of getting things out. Behind singer Justin Furstenfeld's impassioned vocals there's another driving force: brother Jeremy Furstenfeld on drums. And behind Jeremy--or rather, in front of him--are his Yamaha drums. "I love my drums," Furstenfeld exclaims. "I really do. It's my job, and these are my tools. I used to be an electrician, and I had a set of tools for that job--and of course I didn't love doing that as much as I do this, but it's the same thing. I've got an Absolute Maple Nouveau kit in gold sparkle, with a 24" kick, 14" rack, and 16" and 18" floor toms. And that kick drum is just driving the whole thing. It never stops." The band recorded the new album at Willie Nelson's studio in Austin. "The room was just beautiful," Jeremy recalls. "I was really happy with the tones I got, and I was so proud to have my drums on this whole record. CJ Eiriksson, our engineer, did an interesting thing where he miked both the tops and the bottoms of the toms. I think he used the same mics on both sides, and threw them out of phase. It was a sound I've never heard before, especially coming out of my drums. 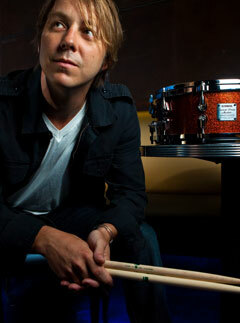 Even Steve Lillywhite, producer extraordinaire, loved the tones, and he's been recording Yamaha kits for a long time." For Furstenfeld, maple toms and kick drums are the way to go. "I fell in love with the first maple kit I got, so why change it?" he says. "There's just a warmth there, a tone that I can't explain. When I hit each tom, it's so full. It doesn't take a lot to get them in tune, and they sound amazing right off the bat." Though he remains glued to his Absolute Maple Nouveau kit, Jeremy enjoys experimenting with different snares. "I have a Yamaha birch snare that I got with this kit, and it's my favorite wood snare drum. I also have a bamboo snare--I just love that drum. I played it on a bunch of songs on this last record." Jeremy's latest acquisition is Yamaha's Mike Bordin signature snare. "It's my main snare for this tour," he explains. "Unfortunately I got it after we recorded, because I would have recorded every song with that snare if they'd let me! It sounds so good. It's so thick, with this great, low-end tone, but you can still get a nice crack out of it. You can get a different sound on this snare pretty much anywhere you hit it. And the rim shot just explodes." Still, there's more to playing drums than getting great tones, Furstenfeld says. "I've learned not to be that guy who says, 'Hey, look at me.' It's always for the song, and it should always be for the song. And drums are like therapy, for both the players and the listeners. Sometimes I'll go to my drum kit when I'm upset or frustrated, and I probably hit them harder than I should, but it's healthy. It's a healthy way of getting things out." Blue October has been touring the U.S. since the release of Approaching Normal, and they're heading to Europe this summer. "We've never really had the opportunity to work in Europe before this year," says Furstenfeld. "It's like starting over: You play a 250-seater, a couple 300-seaters, then a 500-seater, just trying to build things. It's so hard, especially in these times. But we finally have Universal on our side, so we're getting to spread our wings a little and see more of the world." Wherever their music takes them, Jeremy is ready for the journey. "I just love what I do," he says. "I'm not very fancy or flashy. I just play from the heart, and it works. There are probably a lot of other drummers out there who have studied their whole lives, who can read music, but they're in a cubicle, and I get to do this. I just sit back and rock, and I couldn't be happier."